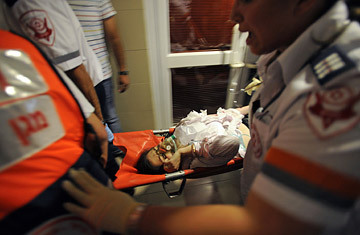 Israeli medics evacuate a wounded woman from the scene of a rocket attack in the southern city of Ashkelon May 14, 2008. U.S. Secretary of State Condoleezza Rice was discussing terrorism with Ehud Barak, Wednesday, when an aide rushed in to inform the Israeli Defense Minister that Palestinian militants had just fired a rocket from Gaza into a woman's clinic located in a large shopping mall in the southern Israeli port city of Ashkelon. "Let's go down there together," Barak told Rice, according to an Israeli source. "I want you to see with your own eyes what we're going through." Rice, who is accompanying President George W. Bush on a visit to celebrate Israel's 60 years of independence, declined. Routine diplomatic security would preclude a top U.S. official being placed in harm's way, and the presence of the Secretary of State within in range of their Katyusha rockets could tempt the militants to fire again. Rescue workers who crawled through the debris of the second-story clinic reported that 15 Israelis had been wounded in the attack, three of them seriously. Earlier on Wednesday, Israeli forces killed four suspected Palestinian militants in Gaza. But the militants' use of the medium-range Katyusha rocket was not an act of revenge as much as a warning to Olmert. Abu Abir, a spokesman for the Popular Resistance Committees, which claimed credit for the attack, said: "This is a message to Israel that if it continues its escalation and postponement of cease-fire, the Zionist residents in southern Palestine will live under life-threatening responsibility." He was referring to Egypt's efforts to broker a truce between Hamas and the Israelis, in which Gaza militants would stop firing rockets and the Israelis would stop targeting militant leaders for assassination. Insiders told TIME that the Egyptian truce deal fell apart after Israel had added a demand for the release of captive Israeli soldier Gilad Shalit before it would agree to the cease-fire. Hamas says it is prepared to release Shalit, but only after the truce is in force, and in exchange for Palestinian prisoners held by Israel. One Hamas official also claimed that the Ashkelon rocket has been a message to the visiting U.S. President not to overlook Palestinian demands. "He is only looking at the Israeli side, but there's a Palestinian face on the other side of the coin," the official told TIME. Even before Wednesday's rocket attack, Bush, in meetings with Olmert and his top cabinet officials, had pledged U.S. solidarity in fighting Palestinian terrorists, as well as in confronting Iran. "We stand with democratic nations against terrorism," he said. "We stand with Israel against the Iranian nuclear threat." The rocket attack appears to be an attempt by militants to underline their centrality to the political equation in the Palestinian territories. And it will undoubtedly lead to an escalation of violence. The Israelis will likely show restraint as long as Bush and other V.I.P. guests are here for Israel's anniversary celebrations, but once the party is over, Israel is likely to strike hard in Gaza once again.